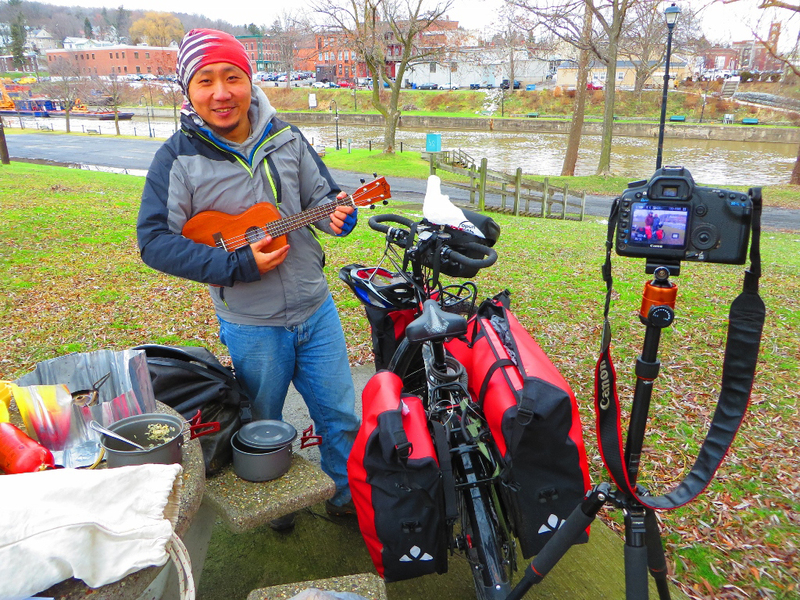 World- tour bicyclist Zhai xu Dong was a “really happy camper” on Wednesday, December 30, 2015 as he finished his hot- noon- day lunch on the snowless banks of the cold Erie Canal in Lyons, NY, a far distance from his home of Beijing, China. For distance bikers like Dong, distance simply means a few more days or months on the trail and a few thousand extra pedal pushes! Dong, an IT Engineer, quit his job on April 26, 2012, biked out of Beijing, and began his life-time dream of cycling the world. Since that day, he has “biked many miles”- nineteen countries including biking through Viet Nam, Cambodia, Thailand, Turkey, Iraq, and Iran. Dong began the present phase of his world tour in Ottawa. After touring Canada, he crossed the Rainbow Bridge at Buffalo. He has followed the NYS Erie Canal Bike Trail from Lockport to Lyons. From Lyons he is headed to New York City. From New York, he is flying to New Zealand to participate with many of his friends in a major bike tour. When he returns to New York City, he will continue his world tour and begin biking to Los Angeles, California. On his world tour, Dong makes great use of his GoPro, uses solar panels to charge his many camera and cellphone batteries, cooks “well but frugal”, and dresses in layers. He carries two sleeping bags- one for “cold” and another for “really cold”, and sleeps “wherever”! Dong speaks Chinese and English, but has also managed basic conversation in other languages. According to Dong, the secret is to learn all the important words in the language of the country you intend to visit- words like “Please”, “Thank You”, “Phone”, “Help”, “Food”, and “Toilet”. While on the road or trail, Dong frequently refers to the google Open Cycle Map for bike trail information. He stays in touch with his family and friends through We Chat and through Weibo, the Chinese equivalent of Twitter. According to Dong, “I am in daily contact with bikers from around the world”! A portion of Dong’s world tour has been sponsored by the Boskey Bike Corporation, a two year old bike manufacturer in China. According to Dong, “The bike is meant specifically for long distance touring, not mountain climbing or road racing”. Vaude, a German manufacturing company, has provided bicycle bags and luggage carriers. Dong is biking to “experience” the world. He is in no hurry to finish his world tour. Depending on the “vibes”, he may pass through a community or stay several days learning, sharing, and experiencing the culture and mind set of a particular locality. A book or a movie may be in the future, but for now, Dong knows one thing is certain: “No matter where I am, every day is a surprise, and that is what makes every day exciting and normal”! Watch XuDong preparing to leave the Lyons Southside Canal Park along the Erie Canal . 1 Comment to "Beijing, China to Lyons, NY on a Bike, By Robert Stopper, Lyons"
Ran into him in Geneva on that afternoon. Charmer!